Kayaking is a fantastic hobby for kids to enjoy – it’s a great way to spend time outdoors and will help ensure your kids stay fit and active. It can be difficult to determine which kayak you should choose for your child, as there is a vast choice out there. Here, we take a look at some of the different options available and have reviewed 10 great kayaks for you to choose from. We also have some helpful tips about what to consider and what different types of kayak you are likely to come across, so you can make an informed decision as to which will best suit your child. 3.0.1 What are the Different Types of Kayak? 3.0.2 What Features Should I Look for in a Kids Kayak? Child’s age and size: This should be one of the first things to consider when shopping for a kayak. Kayaks come in all different sizes, so each is suitable for kids of a different age. If your child is too small or light, they will have difficulty controlling the boat. On the other hand, if they are too tall or heavy, the kayak may be at risk of sinking, and your child won’t have a comfortable ride either. Style of kayak: Many kayaks which are aimed at children are of the ‘sit-on-top’ style. This means that unlike a typical adult kayak which has a cockpit, the top surface of the boat is flatter and kids simple sit on top as the name suggests. These are safer for kids, as if they happen to capsize, the child won’t be trapped underneath the boat. These boats also tend to feature small scupper holes to allow water to drain off easily. Stability features: Children’s kayaks tend to feature a double hull, as opposed to the rounded bottom typically found on sit-inside kayaks. The double hull is much more stable, which is an excellent feature to have on a kids boat. You might also find reverse chines on your child’s kayak, which also help with stability and tracking, keeping the boat moving in a straight line. Width is also a factor when it comes to stability. In general, the wider the kayak, the more stable it will be on the water. So for this reason, it’s good to check the width before buying. Child’s level of experience: If your child is a complete beginner, you should choose a boat which is aimed at those with little to no experience so they can learn safely. For older children or those who have owned a kayak previously, you might like to consider a model with more advanced and impressive features. This kid’s inflatable kayak is durable yet lightweight and features a strong pattern for maximum visibility on the water. There’s a cargo net on the front of the boat which can be used to store a few small items. 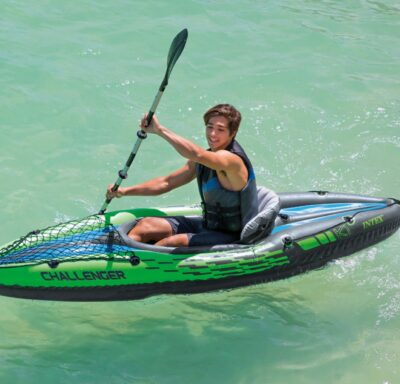 The maximum weight capacity of the Challenger is an impressive 220 pounds, so this one is great for older kids, teenagers or even adults – this is the best family kayak for everyone to share and enjoy together. An aluminum oar is included, as is a repair patch and a hand pump. The boat is made from rugged vinyl and features a removable skeg, which helps keep the boat straight in the water. The seat is also inflatable and can be adjusted depending on the size of the user. It can also be removed to give more space inside the cockpit if necessary. A carry bag is also included to store everything together, making taking this kayak to the water extremely easy. The Wave kids kayak is designed for use by kids as young as 5 years old, and has impressive safety features parents will love. The boat is 6 feet long, and comes with a paddle so it can be used straight away. It features a reverse chine and sit-on-top design, meaning it is stable to help kids climb on and off easily. 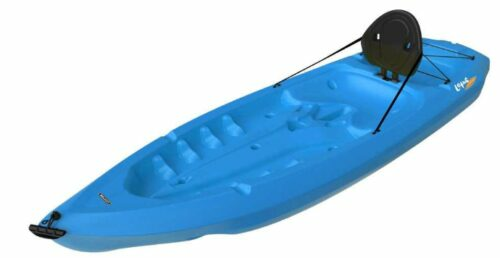 The kayak is made from high-density polyethylene, which is strong and durable, to ensure it can be used and enjoyed for many years. It’s designed to hold kids up to 130 pounds, so you can be sure you’ll get great value for money with this boat. There are different footrest positions too, so your child can always sit comfortably even as they grow. The boat features scupper holes to ensure the cockpit area remains well-drained, preventing a build up of water in this area. The width of this kayak is 24 inches, which is ideal for helping it stay stable on the water. Finally, it includes a handle on the front for easy carrying to and from the water. This child kayak is suitable for those over the age of 5 years old and weighing up to 120 pounds. It measures 6 feet long and 26 inches wide, which is excellent for stability. The shape of the hull also helps greatly with stability, making this a great choice for beginners. The boat weighs only 21 pounds, so it’s easy to carry to and from the water. This is further aided by the front and side handles. There is also a paddle included, which measures 50 inches long. There’s plenty of storage on this small kids kayak, making it the ideal choice for a day trip. There’s also an all-important water bottle holder next to the seat so kids can stay hydrated whilst they’re having fun. There are multiple footrest positions on this boat, so kids can always be comfortable even as they grow. There is a comfortable, padded backrest which can be folded away when not required. This kids sit on top kayak measures 8 feet long, making it ideal for older children. There are multiple footrests too, so kids of all sizes can comfortably ride in this kayak. The maximum weight capacity is an impressive 225 pounds, so adults can also ride on this fantastic kayak. The bottom of this kayak is flat, offering excellent stability when boarding and paddling. There are small holes for draining water out of the cockpit, and there’s also a backrest for maximum comfort. Cargo storage areas can be found at both the front and the rear of the boat, and there is also a handle at the front. Unfortunately, no paddle is included, so it’s necessary to buy a kids kayak paddle separately. This Lifetime kids kayak is 10 feet long, so it’s best suited to older kids and even teens and young adults. It features a sit on top designs and a backrest for maximum comfort. There are also four different footrest positions, so it’s perfect for growing boys and girls. A two-piece paddle is included, so this kayak is ready to use straight from the box. This kayak is strong and durable – it’s made from high density polyethylene, which is resistant to UV rays and also to impact. In spite of this, the kayak weighs only 50 pounds. It even has handles on both the front and the rear to make carrying easy. There is plenty of storage available on this boat, notably the partially enclosed compartment on the rear. This Lifetime kids kayak has a simple design, yet is packed full of great features. It’s 6 feet long and 24 inches wide, and has a weight capacity of 150 pounds. There is a paddle included, so kids can get going straight away. You’ll also find a useful carry handle on this kayak, and it even comes with a 5 year warranty so you can be sure of the quality. The child size kayak is extremely safe for kids as it has scupper holes to keep the cockpit drained, and it also has a reverse chine. There are also paddle cradles which are ideal for when the child is being towed or otherwise doesn’t need to paddle. Children as young as 5 years old can enjoy this kayak, and there are different footrests to allow for growing room. They can easily climb aboard by using the swim-up, step-in back. The SeaFlo kayak is ideal for kids as well as small adults, as it can hold up to 130 pounds. The boat itself only weighs 18 pounds, so it’s easy to carry and transport. There are three footrest positions to accommodate growing children comfortably. 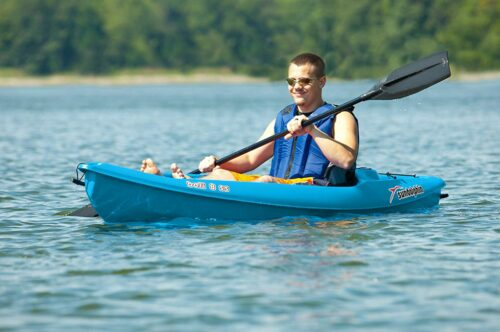 Like many others, this kayak is made from polyethylene which is excellent for both maneuverability and stability. The SF-1001 is designed to be almost impossible to sink, which is excellent for parents concerned about safety. It’s ideal for using in lakes or on slow rivers, and it offers a padded backrest for maximum comfort on longer rides. No paddle is included, so you’ll need to find one which is the right size for your child. This kids fishing kayak comes in a choice of 3 bright colors to ensure good visibility on the water. It’s light enough to carry with ease, and features a very open cockpit to allow kids to climb in without difficulty. The padded backrest can be adjusted to give maximum comfort when paddling. Like with many other models, the Sun Dolphin features different foot positions to ensure your child is always comfortable. There is a small storage bin available to the rear of the kayak, sufficient for a few essentials. The kayak is 8 feet long and can hold just under 200 pounds, so it’s ideal for adults to use, too. For older kids or teenagers who require a bit more space, this model is also available in a 10-foot version. The kayak can be used for a variety of purposes, and is easy to control and balance. This is another great offering from Sun Dolphin, also coming in at 8 feet long and featuring a sit on top design. This one comes with a square stern, giving it impressive stability. Kids will be able to climb in very easily thanks to the wide open cockpit. There is also an adjustable backrest and various foot wells so kids can always ride comfortably. The storage space on this kayak is good – there is a large area at the rear which is covered by bungee cords to secure a small load. There are also molded handles at either end of the boat – the front one could potentially be used to attach a tow rope if necessary. Many parents love this kayak because it can fit in most average sized cars, so there’s no need for a roof rack. This Lifetime kayak is ideal for kids of any age as well as adults. There are many foot positions to ensure everyone can have an enjoyable and comfortable ride. It even comes with a paddle so families can get out on the water straight away. There are loads of convenient features on this boat which will make it a hit with both parents and children alike. There’s the bottle holder, rear cargo area, quick release seat back and scupper holes for drainage. The 8-foot kayak is extremely stable, and difficult to flip over even if you try! So, parents can rest at ease knowing their child is safe on board this boat. It’s made from sturdy polyethylene, yet is light enough to carry to the waterfront with ease, as it weighs only around 30 pounds. The Sun Dolphin Bali 8 Foot Kayak is our top pick for many reasons. It’s large enough to be used by adults, yet also manageable for older children, meaning it will provide many years of use. It’s also light to carry, and has impressive storage facilities on board. The cockpit is comfortable to sit in on longer paddles, and there is even a drinks holder for convenience. This is a great kayak for children and young adults, and it comes in the smaller size of 6 foot for younger kids, and 10 foot for those who are taller or heavier. It’s an all-round great choice. There are many children’s kayaks for sale at excellent price points, which still offer a range of impressive features. Our favorite cheap kids kayak is the Lifetime Wave – it costs around $100 yet is packed full of features you would expect to see on a much more expensive boat. It has excellent safety features such as the reverse chine for stability and scupper holes for drainage. It even comes with a paddle for kids to get going straight away. What are the Different Types of Kayak? There are different styles of kayak available, each suitable for different age groups and purposes. As discussed previously, the main style found in children’s kayaks is the sit-on-top design. 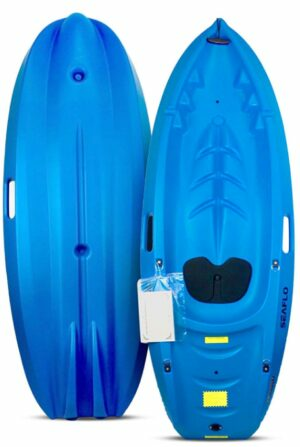 You can also find inflatable kayaks, which are ideal for traveling or when limited storage space is available. Older kids and teenagers might be able to use a standard sit-inside style kayak. There are also kayaks available for specific purposes, such as those for using in white water, however kids kayaks are fairly multi-purpose. What Features Should I Look for in a Kids Kayak? The most important thing to look for when buying your child a kayak is the safety features. The sit-on-top design is much safer for children as the risk of becoming trapped under the boat should it capsize is very small. You might also like to choose a model to which a tow rope can easily be attached. There’s nothing worse than having your child decide they are too tired to paddle any more when you are a long way from the shore! Some parents look for paddle holders as these can reduce the risk of the paddles falling into the water when the child is being towed. Certain kayaks come with comfortable, padded, backrests which can help make sure the child has a comfortable ride, especially if they will be using the boat for long periods. Some models also include a storage compartment which can come in handy. You might also find a drinks holder on certain models of kayak. This is a great feature as it will encourage your child to stay hydrated when they’re out on the water.